Gala Bingo always has new slot games flowing in from the most reputable gaming companies all over the world. They have everything to please you, from the amazing graphics to the excitement of the big wins. What’s New At Gala Bingo? Get started on mining rubies, sapphires and emeralds on Lightning Gems slots by NextGen Gaming. Get ready to be blown away by perfect graphics, prominent and animated symbols. The 5 reels and 10 payline slot game has a stunning jackpot that goes up to £20,000,000! In the game, you’ll find the wild and scatter which are also the high paying symbols that you’ll find landing on the reels. Make your bet as from 0.20 to the highest stake bet of 200.00. Enjoy an enhanced gameplay at Gala Bingo on Magpie Mayhem slots. With 5 reels and 10 paylines Magpie Mayhem has the Free Spins and Gamble Bonus feature to keep you busy for hours. Win big when the High Roller button comes in play. The High Roller Feature can be played from three different prices, £20, £30 and £50 where all your advantaged to winning are enhanced. Inspired by King Henry VIII, these 5 reels and 20 payline slot game gives you a great gameplay with cartoon HD graphics and sharp sound effects that match the theme. Benefit from the wild symbol that replaces for all symbols except for the scatter and which is also the highest paying symbol in the lot. Henry VIII slots also features a: Feature Wheel, where you could win free spins and mega multipliers. 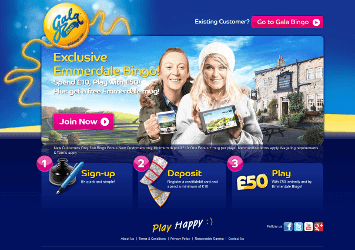 Enjoy amazing games at Gala Bingo. Claim your welcome bonus today, which is super quick and easy. Deposit £10 and receive £30 bonus where £20 can be played on bingo and £10 can be played on slots.